These rounds from Wolf are great for taking small deer and medium game with your favorite AR-15, Mini-14, or any other rifle chambered for .223 Remington or 5.56mm NATO. Each of these cartridges is built with price efficiency in mind and utilizes a berdan-primed, steel casing topped with a 55 grain soft point projectile. Soft point bullets are mostly jacketed but have an exposed lead tip which is designed to expand and mushroom out during entry into a game animal; this ensures that the bullet transfers nearly all of its energy into the target and delivers the appropriate amount of damage upon vital organs. The 55 grain weight is common for the .223 caliber and will match the most common zeroing charts and bullet drop compensation reticles. This translates into familiar holds and reliable precision for those precious hunting opportunities. 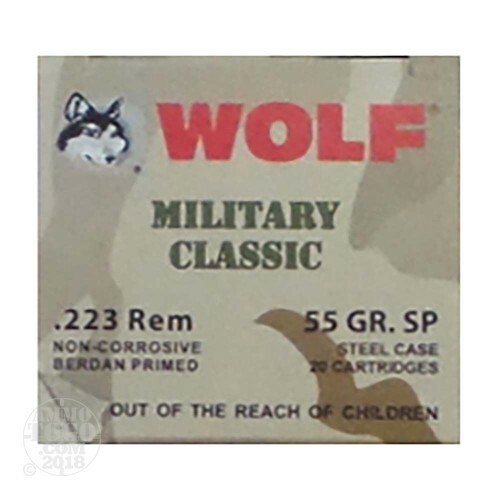 Wolf Military Classic is mainly manufactured at the Tula Plant which has been Russia's main source of small arms munitions for local use and exportation throughout numerous wars and arms races. This vast experience with mass production, combined with shooter feedback has resulted in economically priced ammunition that most sportsmen love!